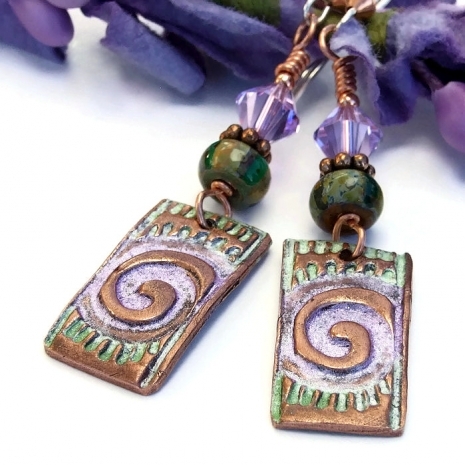 The theme of this blog post came about because I listed a new pair of earrings that feature hand painted copper spiral rectangles by Kristi of KristiBowmanDesign. Whenever I see spirals, I start musing on their ancient . . . and modern . . . appeal in designs. Then knots, bumps and curves came to mind, all of which, along with spirals, can be found pecked or drawn or carved in the sides of caves, on boulders, painted on pottery and used in contemporary pieces. These designs will never go out of style.